Are you a collector? Do you have a treasured collection that you enjoy looking through and spending time with? I am not a collector in the traditional sense, but I must admit I have zillions of recipes stockpiled throughout my house. Cookbooks line my bookshelves, handwritten recipe cards are housed in an old card file, magazine clippings are stuffed in files, and there are multiple recipe folders on my computer’s hard drive. My favorites are the handwritten recipe cards. I love looking at recipes in my grandmother’s handwriting, recipes that she enjoyed making for our family many, many times over the years. Several of my family’s favorite dishes come from recipes written in my Mom’s beautiful handwriting. In a large glass baking dish, whisk the red wine, mustard, brown sugar, garlic, shallots, parsley, thyme, 1 tablespoon of salt and 1 teaspoon of pepper. Add the steak and turn to coat. Let stand at room temperature for 2 hours or refrigerate for up to 8 hours. Meanwhile, in a medium bowl, whisk the cider vinegar and honey. Add the tomatoes and onion and toss. Let stand for 1 hour. Light a grill. Coat the asparagus and corn with olive oil and season with salt and pepper. Grill over moderately high heat, turning occasionally, until tender and browned in spots, about 3 minutes for the asparagus and 6 minutes for the corn. Transfer to a work surface; when cool enough to handle, cut the asparagus into pieces and cut the corn from the cobs. Add the asparagus, corn and basil to the tomatoes and toss. Remove the steak from the marinade and pat dry with paper towels; season lightly with salt and pepper. Grill the steak, turning once, until medium-rare, about 10 minutes total. Transfer the steak to a work surface and let rest for 10 minutes. Meanwhile, in a skillet, melt the butter. Add the morels and cook over moderately high heat until browned, about 3 minutes. Season with salt and pepper. Thinly slice the steak against the grain and transfer to plates. 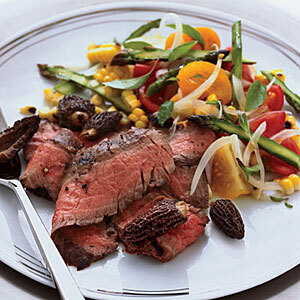 Season the tomato salad with salt and pepper and spoon alongside the steak. Top the steak with the morels and serve. Place beef, 1/4 cup cilantro, onion, scallions, garlic, chili powder, cumin, oregano, pepper and salt in a large bowl. Gently combine, without overmixing, until evenly incorporated. Form into 4 equal patties, about 1/2 inch thick and oval-shaped to match the rolls. Combine the remaining 1/2 cup cilantro, mayonnaise, lime juice and chipotle in a small bowl. Oil the grill rack (see Tip). Grill the burgers until an instant-read thermometer inserted in the center registers 165°F, about 6 minutes per side. Top with cheese and cook until it is melted, about 1 minute more. 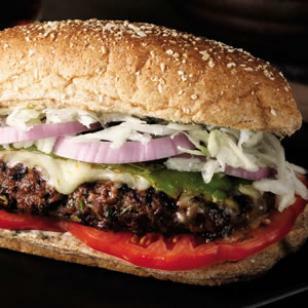 Assemble the burgers on toasted rolls with the chipotle mayonnaise, half a roasted pepper, cabbage, tomato and onion. My family and I, like all of you, have been busy the past few weeks. 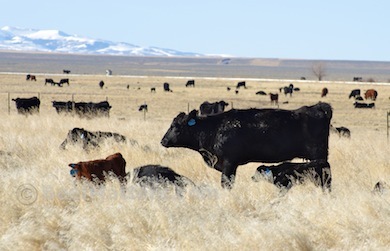 Our day-to-day work has involved calving, moving yearlings to different pastures, hauling protein block to the cows on the desert, buying bulls, studying the futures market, attending beef industry meetings, and a birthday party or two. It has been a little busier than normal, but not unusually so. What was unusual was that while we were working and making long-term business decisions, our industry was being attacked by the media. 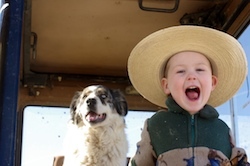 It is unbelievably frustrating to work hard, day in and day out, taking time away from our kids because we believe our hard work now will continue to improve our ranch and our industry for their generation. Only to come home, sit down to dinner and listen to the news anchors tell millions of Americans that beef is unsafe. “…any home cook could separate beef fat from beef muscle with a knife and cutting board, creating the same boneless lean beef trimmings. But long lines of butchers working with knives on such a difficult task would not be economically feasible. That’s why before BPI came up with a mechanized process to do this, such trimmings were often leftovers that ended up being used for pets or oils. To reduce waste and increase protein, BPI did its own research and development and came up with a proprietary process. While the company does protect its intellectual property, it is not secretive when it comes to sharing the outcomes. The BPI grinding process is built around a centrifuge that removes beef fat, resulting in a product that is 90 percent or more lean beef. 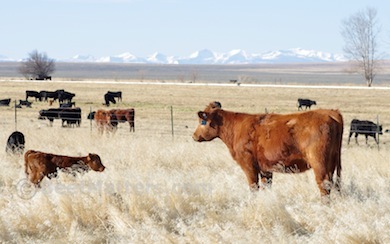 The process includes the use of an ammonia and water bath (ammonium hydroxide), which has proven to be one of the beef industry’s most successful interventions against harmful bacteria — microbes that can sicken and kill. It works as an antimicrobial agent by slightly increasing the naturally occurring ammonium hydroxide levels in beef and by doing so eliminates harmful pathogens. The use of ammonium hydroxide is not uncommon in food manufacturing. It is used as a leavening agent in baking, to produce caramel, and in drinking water. It’s used in grains, baked goods, condiments, pancakes, chocolates, puddings and cheeses. I don’t claim to be an expert in meat processing and I have learned a lot about this process over the past several days. The most interesting part, in my opinion, is how many other food products also use this process. I really had no idea that ammonium hydroxide was so prevalent in food manufacturing. Am I going to limit my family’s intake of those particular food items? No, I am not. When I learned about the rigorous, science-based research that was done on this process before it was approved by the Food Safety Inspection Service, I decided that it is perfectly safe for my family. “As Administrator of the U.S. Department of Agriculture’s Food Safety Inspection Service (FSIS) in the early 90s, I and my staff evaluated numerous research projects before approving lean, finely textured beef as a safe source of high-quality protein. The FSIS safety review process was and is an in-depth, science-based process that spans years, many research projects and involves many experts across all levels of the agency-and in this case, the process proved the product is safe. During calving season we get excited about all of the new baby calves. We invest a lot of time in selecting the proper bull or A.I. sire to use with our heifers and spend additional time choosing a few new bulls for our main cow herd. After nine months we finally get to see the results of our work and planning. 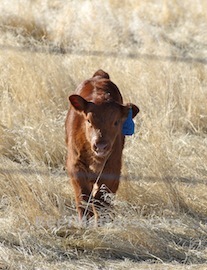 Through our record-keeping process we track the sire of each calf. We keep records on these calves until we sell them next fall. These records help us with our future bull buying decisions and whether or not to use a bull again the following year. There are piles of statistics on bulls that help us make our decisions. 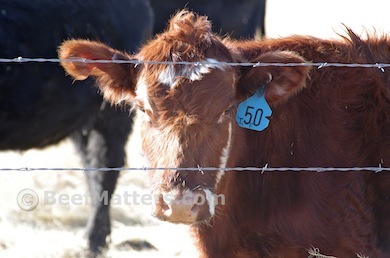 Birth weight, weaning weight, yearling weight, the lists go on and on. And on! For the heifers, we look at the statistics that we can measure within the first year, for example, femininity and disposition. As exciting as the calves are, I also enjoy watching the heifers become mamas. They have never done this before, this is their first calf. 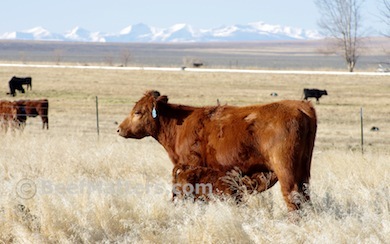 My favorite heifers are those who know that calf is theirs and they will protect that calf from any and all threats. “Threats” may include cowboys in the feed truck, dogs wandering through the field or women armed with a camera. Those new mamas don’t care who you are. You are not going to mess with their calf and that’s final! I like to think that I had those same powerful maternal instincts as a new mom. Protecting my children from any and all threats. 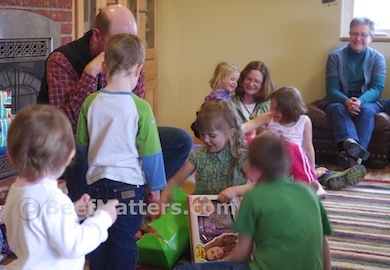 After time I grew weary of the constant threats to a small child. Eventually, and thankfully, common sense took over and I eased up (just a little, I’ll admit) on the over-protectiveness.